ZERO “GOD’S COUNTRY” (‘46 Action/Screen Guild) An unbilled Whip Wilson makes an appearance as a marshal in the final scenes. One also wonders if that’s Whip singing “Trees” over the titles? Northwoods tale starring Robert Lowery, Buster Keaton (!?!) and the dog Ace was originally in Cinecolor. “SILVER TRAILS” (‘48 Monogram) Monogram introduced Whip Wilson to B-western audiences in this average Jimmy Wakely adventure. “Silver Trails” was started June 25, 1948, and released August 22, ‘48. Whip signed his Monogram contract three days earlier on August 18 with the intent of using the screen name Dan Tyler. According to Whip chronicler David Godwin, Tyler is the name listed on the “Crashing Thru” callsheet. Fortunately, clearer heads at Monogram prevailed and went with Whip (the only name, incidentally, used in “Silver Trails”) and the alliterative last name of Wilson. Thank goodness also, they afforded Whip a different hat (apart from the Buck Jones style worn here) and a white horse by the time of “Crashing Thru”. 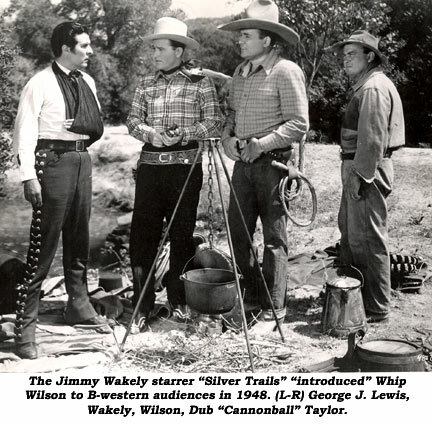 In “Silver Trails”, yet another Monogram variation on the tried-and-true land grab plot, county surveyor George Meeker and his henchies stir up trouble between a Spanish Don (Robert Strange) and his nephew (George J. Lewis) and rancher William Norton Bailey and his daughter Christine Larson (with whom Lewis is in love). Jimmy and saddlepal Dub “Cannonball” Taylor run smak-dab into the plot when they come to work for old friend Bailey, even to finding another pal, Whip, working as Strange’s foreman. A lackluster ending relegates this to just an average Wakely—with the real interest being Wilson’s Monogram debut. 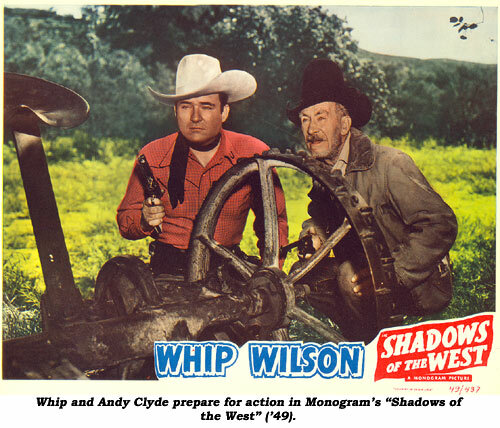 “SHADOWS OF THE WEST” (‘49 Monogram) Adele Buffington (aka Jess Bowers) recycled her “Stranger from Pecos” Johnny Mack Brown screenplay from ‘43 for this second Wilson entry. When Ted Adams and his son Riley Hill inherit a ranch they are framed for murder by banker Bill Kennedy and crooked sheriff William Ruhl. It takes Marshal Whip and his old pal, café owner Winks (Andy Clyde), with the assistance of his niece Reno Browne, to reveal the dirty plot. Whip sang “Red River Valley” in the theatrical version (and a piece of it can still be heard in the preview trailer) but TV prints have cut the song. Whip does sing as he rides away at the end. Whip use: a liberal four snaps! “HAUNTED TRAILS” (‘49 Monogram) Without a doubt the best of Whip’s B-westerns as he sets out on the revenge trail to track down the five bank bandits who killed his brother in a hold-up—Carl Mathews, Lee Roberts, Myron Healey, I. Stanford Jolley and Dennis Moore. Whip enlists the aid of grizzled old outlaw Andy Clyde and gets involved in saving Reno Browne and Mary Gordon’s ranch from slick banker William Ruhl. Whip briefly sings acapella and uses his bullwhip three times—once on a rattlesnake to save Clyde and once to spectacularly come crashing through a storefront window. A remake of Jack Randall’s “Mexicali Kid” (‘38). “RIDERS OF THE DUSK” (‘49 Monogram) U.S. Marshal Wilson rides to the aid of another Marshal in capturing a cattle rustler known as the Phantom Rider but is mistaken for the Rider and blamed for the other Marshal’s death. 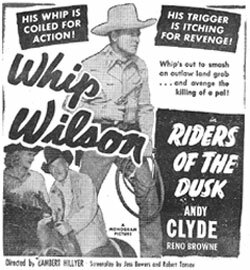 Whip then fights on the side of Reno Browne and her friend Lee Roberts—who is the real mystery rider—as they’ve only been “reclaiming” cattle rustled from them by outlaws. Whip use: 5. “RANGE LAND” (‘49 Monogram) Ex-Marshal Whip and his pal Andy Clyde help stamp mill operator Steve Clark and his daughter Reno Browne recover $50,000 in gold bars stolen in recent stage holdups by Leonard Penn and his gang which are being smelted down for them. Whip use: 3 times. Scott Dunlap, exec-producer on the Wilsons, recycled a script written by Robert Emmett (aka Bob Tansey) for Jack Randall in ‘38, “Gun Packer”, when Dunlap was producing that series. “FENCE RIDERS” (‘50 Monogram) When Whip and Andy Clyde come to the aid of pretty rancher Reno Browne, they discover one of her trusted hands, Riley Hill, working hand-in-glove with saloon owner/rustler boss Myron Healey who frames Whip for the murder of Hill. Whip snakes out his bullwhip four times. 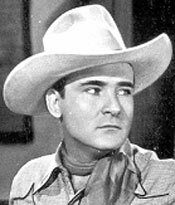 Never billed as a “singing cowboy”, Whip did manage a song in a film or two, such as “Sweet Genevieve” sung here in an operatic style. It’s been rumored Johnny Mack Brown, apparently waiting for a scene in one of his own films, can be seen in a crowd or lolling against a hitch rail. However, neither I nor Wilson expert David Godwin have ever spotted him, so it’s quite doubtful. 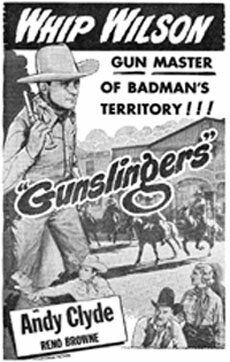 “GUNSLINGERS” (‘50 Monogram) The railroad is coming through! Whip comes to the aid of Andy Clyde, telegraph operator Reno Browne, and the rest of the drought stricken citizens who are being menaced by saloon owner Bill Kennedy, phony marshal Dennis Moore and their henchies. Whip use—3. Nice inter-cutting between three locations—Walker Ranch, Iverson’s and Melody (Monogram) Ranch by director Wallace Fox. Reno Browne (1921-1991) was Whip’s leading lady in 6 westerns, this being her last. A rodeo queen out of Reno, NV (hence her name), she was one of the best female riders in the business. She was married for a brief period to that other whip-wielder, Lash LaRue. “ARIZONA TERRITORY” (‘50 Monogram) Adele Buffington, aka Jess Bowers, reworked her “Raiders of the Border” (‘44) Johnny Mack Brown plot to come up with this mild Wilson entry about counterfeiters smuggling their “queer” in Indian pottery from a trading post owned by pretty (but naïve) Nancy Saunders. Andy Clyde is the U.S. Marshal on the trail of the counterfeiters who enlists the aid of old pal, Wilson—who lashes out his snakehide three distinct times. “SILVER RAIDERS” (‘50 Monogram) Arizona ranger Whip (and his two pals Riley Hill and Reed Howes) break up a gang of silver bandits when the gang’s town boss (Leonard Penn) goes too far by kidnapping and holding for ransom a Mexican senorita. The Rangers are helped by sheriff/postmaster Andy Clyde and his daughter, Virginia Herrick. Wilson pops the baddies twice in this one. “CHEROKEE UPRISING” (‘50 Monogram) The bare-to-the-bones budget “uprising” consists of one Indian, Iron Eyes Cody, taking orders from outlaw Sheriff Marshall Reed. U. S. Marshal Whip and partner Andy Clyde break up the gang. Whip possibly lashes out with his bullwhip in this one more than in any of his other B’s, so there’s plenty of action. Also with Lois Hall. “OUTLAWS OF TEXAS” (‘50 Monogram) Using greenhorn outlaw Tommy Farrell as an introduction, undercover U.S. 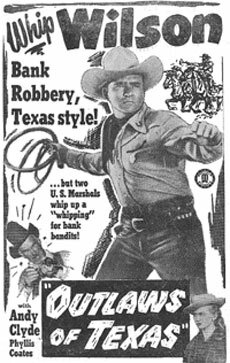 Marshals Wilson and Clyde infiltrate a gang of bank robbers led by a girl—Phyllis Coates—trading on her famous outlaw father’s reputation. Sorehead outlaw Zon Murray gives the film most of its interest. Whip use—3. “ABILENE TRAIL” (‘51 Monogram) Starts with a burst of action as a posse chases Whip and Andy on a mistaken charge. Helped to escape by a wounded Tommy Farrell, Whip and Andy sign on with Tommy’s cattleman father and sister (Noel Neill) to get the big herd through to Abilene ahead of conniving cattleman Bill Kennedy. Mild, with Whip never using his snakehide even once. 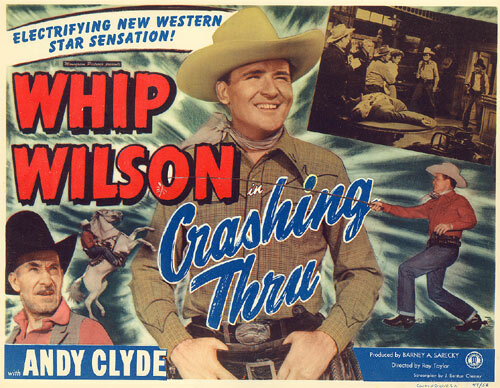 This was the last Wilson featuring Clyde as Whip’s sidekick and the series definitely took a tumble with his loss. “CANYON RAIDERS” (‘51 Monogram) Whip, while visiting his old pal, rancher Jim Bannon, runs across horse rustlers. Phyllis Coates is mighty feisty as a buckskin Sheriff. With this film, Whip’s original sidekick, Andy Clyde, was gone, replaced by former Universal regular Fuzzy Knight and second lead Bannon. This trio lasted for six entries, then even Bannon was let go in a further economy move. Pretty tame. Whip use—once. 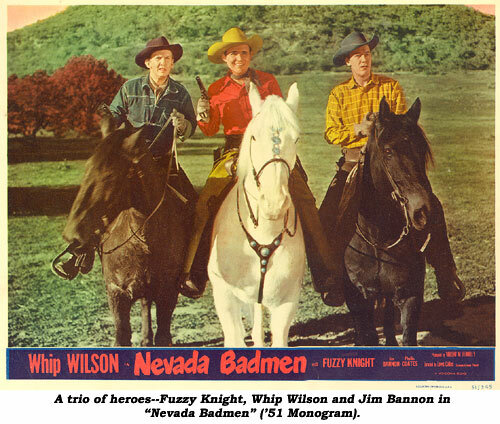 “NEVADA BADMEN” (‘51 Monogram) Kenne Duncan discovers gold and sends for his brother, Jim Bannon, who brings along pals Whip and Fuzzy Knight. Unfortunately, crooked express agent I. Stanford Jolley, banker Bill Kennedy and their henchmen also learn of the gold and kill Duncan. Our hero-trio helps Duncan’s daughter Phyllis Coates find the unrecorded mine and save the ranch. The threadbare budgets under producer Vincent Fennelly were really beginning to take a toll. This one lets Whip pop-it only once, and that’s while he’s herding cattle. The film is simply saddled with too much milling and riding around. “STAGECOACH DRIVER” (‘51 Monogram) Screenwriter Joseph O’Donnell dusted off his Buster Crabbe “Devil Riders” (‘43) plot for this stagecoach vs. Pony Express mail contract tale with the Whip, Jim Bannon, Fuzzy Knight trio. Gloria Winters (“Sky King”’s niece Penny) makes her only B-western appearance. Whip wears a buckskin outfit and long white scarf completely unlike clothes he donned in any other oater. He snakes out his bullwhip only one time. “WANTED DEAD OR ALIVE” (‘51 Monogram) The genesis of this plot really began with “Flaming Bullets” (‘45) with Tex Ritter and Dave O’Brien, then was milked to death every few years—“Star of Texas” (‘53) with Wayne Morris, “Last of the Badmen” (‘57) with George Montgomery and finally “Gunfight at Comanche Creek” (‘63) with Audie Murphy. A gang bossed by Leonard Penn is breaking wanted outlaws out of jail then killing them to collect the reward. Marshals Whip, Fuzzy and Bannon bring justice to these polecats. Whip uses his snakeskin once, very quickly. “LAWLESS COWBOYS” (‘51 Monogram) Rodeo events are being fixed in advance so gamblers can bet on a sure thing at terrific odds. The plot idea’s been used before (“Man from Utah”, “Trouble in Texas”, “Mesquite Buckaroo”, “Utah Kid”) but this time has a few new wrinkles as ex-ranger Whip, working for the rodeo association, and rodeo rider Jim Bannon break up the dirty dealings. Whip snaps his lash 3 times. “STAGE TO BLUE RIVER” (‘51 Monogram) John Hart and the mysterious big boss are out to drive I. Stanford Jolley and his daughter Phyllis Coates’ stage line out of business so they can grab the profitable U. S. Mail contract and gold shipments. Whip, Fuzzy and Lee Roberts break up their crooked plans. Whip snaps his lash 4 times! It’s a remake of “Stage to Mesa City” (‘47) with Lash LaRue. 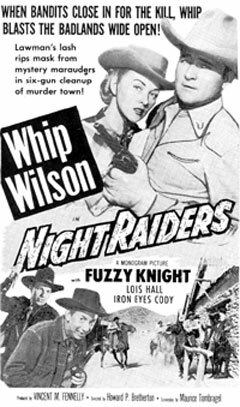 “NIGHT RAIDERS” (‘52 Monogram) Marshals Whip Wilson and Tommy Farrell come to aid of old pal Fuzzy Knight who works for rancher Steve Clark and his gorgeous daughter Lois Hall. Whip must figure out who is ransacking the property of local ranchers during nightly raids without stealing anything. Eventually, Whip discovers the answer lies with town sheriff Marshall Reed who is searching for $15,000 in loot he’s hidden from a train robbery five years ago. This late in the series, the films had become pretty cut and dried. Whip use—3. “THE GUNMAN” (‘52 Monogram) Unavailable for viewing. With Fuzzy Knight, Rand Brooks. “MONTANA INCIDENT” (‘52 Monogram) Unavailable for viewing. With Rand Brooks. “WYOMING ROUNDUP” (‘52 Monogram) After stopping a gunfight in the saloon, Whip and sidekick Tommy Farrell are appointed by the town council as the law in a small town where a group of supposedly upright citizens are hiring gun-buzzards to stir up a feud between two families in hopes of taking over both ranches for themselves. Wilson oddly goes whipless in his last of 22 B-starrers for Monogram. Tommy Farrell used to joke, “They sold the whip to finance the picture.” This finale is not Whip’s best, but not his worst either, due in part to noted director Thomas Carr. Whip Wilson (Roland Charles Meyers) was only 53 when he died of a heart attack in late ‘64.